Apple finally delivered on its promise of a new iPhone during an event Tuesday at the company’s headquarters in Cupertino, California. It’s no totally new “iPhone 5,” mind you; Apple’s revamped iPhone 4S brings an incremental hardware upgrade to the popular iPhone 4. But the 4S’ stat boost is no slouch, adding a host of beefier under-the-hood specs to an already impressive device. In usual Apple style, the company dropped a wealth of information on the public all at once. We’ve gathered the crucial details on the new iPhone 4S so you know what you’re in for when they hit the shelves Oct. 14. In a step up from the iPhone 4’s single-core A4, the 4S will sport the A5 processor, an Apple-designed, Samsung-made chip that boasts two cores and can be found in the iPad 2. That means better graphics processing (up to 7x faster than the previous iPhone, according to Apple VP Phil Schiller), faster iOS performance and significantly enhanced gaming. Apple’s demo of the iOS-exclusive Infinity Blade II game looked smooth as silk and almost Pixar-esque in quality, according to Wired.com’s Apple reporter, Christina Bonnington. The 4S will run on AT&T’s HSPA+ network, which means download speeds of up to 14.4 Mbps, and uploads reaching 5.8 Mbps (according to Apple, that is). While Apple says it’s “4G speed,” make no mistake — HSPA+ ain’t 4G proper. It’s not LTE, it’s not Wi-Max. We’re thinking the battery drain of a 4G antenna was too much for Apple to sacrifice, not to mention the infancy of existing 4G networks. Also, that speed will only come on AT&T’s HSPA+ network — not Sprint’s, not Verizon’s. Bummer for those on different carriers. 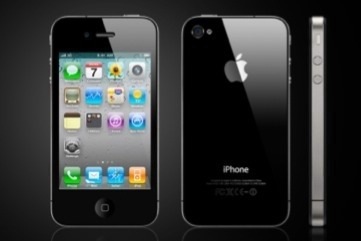 The iPhone 4S will also come with both GSM and CDMA antennas, which means you’ll be able to use the phone anywhere around the world. A nice touch, especially for business-class jet-setters. The first iPhone launched exclusively on AT&T. To Apple’s chagrin, the network couldn’t handle the influx of data-hungry customers, and complaints of terrible AT&T service have been widespread ever since. In February of this year, the iPhone 4 finally came to Verizon’s vaunted network. Continuing the trend toward carrier agnosticism, Apple said Tuesday the iPhone 4S would be available on Sprint’s wireless network for the first time (as well as Verizon and AT&T). It’s a huge slap in the face to AT&T, which once held the keys to the iPhone kingdom. Now, Apple must compete with Android’s multicarrier reach and can’t afford to play favorites in the carrier arena. The iPhone 4S really beefs things up on the photo front. It packs an 8-megapixel camera that comes in at 3,264 x 2,448 resolution. That’s 60 percent more pixels than the iPhone 4’s 5-megapixel camera. A backside-illuminated sensor ensures that those extra pixels don’t go to waste by gathering more light into the shot. The iPhone 4’s camera is composed of five Apple-designed lenses (there were four in the iPhone 4), providing a 30 percent sharper image. It’s got an f/2.4 aperture, which lets in more light, and a hybrid IR filter for better color accuracy and more color uniformity. The camera can also take 1080p HD video with real-time image stabilization. Temporal noise reduction should help in low-light scenarios. The iPhone 4S will launch with a beta version of Siri, a voice-controlled, language-deciphering virtual assistant — probably the coolest feature revealed during Tuesday’s event. Think of Siri as Hal 9000, only nicer. Wondering what the weather is like in Paris? Ask Siri, and she’ll tell you (yes, Siri has a female voice). Looking for a good local restaurant? Apple’s partnership with Yelp will aid Siri, pulling up nearby eateries and ratings straight from Yelp’s user-generated reviews site, all using your GPS data. Exchange rates, stock market information and other data will be just a question away — Siri will even read back your SMS messages from your pocket if you ask her to. While Siri will launch in beta (a very Google-esque move by Apple, a company notorious for only shipping products that are fully finished), we’re excited to give this feature a test drive. Not so fast, eager beavers — the iPhone 4S isn’t available just yet. The phone will launch Oct. 14 on three of the big four U.S. carriers (AT&T, Verizon and Sprint). It will come in 16-, 32- and 64-GB versions at $200, $300 and $400, respectively. And yes, they’ll come in two colors: black and white. Preorders start Friday, so get your mouse-clicking fingers at the ready if you must own Apple’s latest, greatest I phone! Posted on October 5, 2011, in Matt Black vs The WORLD and tagged Apple, iPad, iPhone, new technology. Bookmark the permalink. Leave a comment.